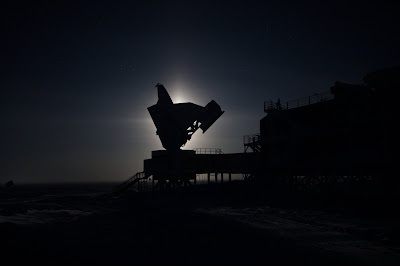 We were treated to another rare and uniquely Antarctic phenomenon the other day, just as the moon was setting. Reaching out from the moon were four bright bands of light, forming a nearly perfect cross in the sky. Halo crosses are (apparently) frequently seen around the sun, but to get a lunar one is fairly rare. It's worth mentioning that this is not an optical effect from the camera or our eyes - it remains perfectly oriented in the sky no matter how you tip your head/camera from side to side. Rather, it's formed by reflections off ice crystals in the air. Humidity in the air condenses into millions of tiny plates of ice, and as they drift down under the influence of gravity and the wind, they all align parallel to each other and to the earth. Reflections of light off different parts of these crystals make various lines and circles of light in the sky. One particular reflection makes the vertical pillars, while another makes a parhelic circle which parallels the horizon. If the moon (or sun) is low enough in the sky and these two reflections are of roughly equal strength and dominate others, you end up with what appears to be a cross-shaped beacon of light in the sky. One of the IT guys down here often comments on how we live in a science fiction movie. Usually that seems about right, but every now and then events seem closer to something out of a fairy tale. AMazing! I don't think I've ever seen that. When does the monn set? Is it as bright as it appears in the photo? It's surprising to see stars in the background. I would have thought the moon's light would drown them out. The moon actually set last Wednesday - it'll be back up in another ten days. It's probably a little brighter than the photo makes it seem, and the cross shape is much more distinct - very sharp horizontal and vertical bars. While the moon is certainly bright - I've been referring to it as 'the sun' in my thoughts for months now - it's still nothing like the real sun. You can see many of the brighter stars, and given a short enough exposure, you can limit the moon's flare enough that it only drowns out the closest stars. Most of my earlier moon-including photos were significantly longer exposure, so the flaring was much worse. I wanted to let you know I'm submitting the IPY post (modified) to the NSTA magazine. I have denoted your photo credit as per our previous discussion.